Besides our incredible Farmers Markets, SEE-LA keeps Los Angeles healthy by offering and coordinating many programs that enrich lifestyles, help the community and enhance our mission. We are dedicated to improving access to fresh, healthy foods by way of CalFresh EBT, the WIC program and Market Match. We also get kids on the right path with the Bring the Farmer to Your School program, which has been in existence for over 15 years. Our Pompea Smith Cooking School and Buena Cocina Nutrition Education Program, in operation since 2002, has been servicing members of the South Los Angeles Community through fun, interactive nutrition programming. Through our most recent 3 year grant term Pompea Smith Good Cooking/ Buena Cocina Program has served nearly 8,000 community members through our 7 class nutrition series. 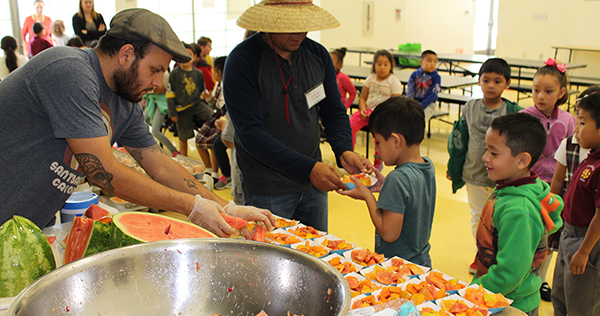 We hosted 640 classes at our Central Avenue and MLK Campus Farmers’ Market in addition to numerous community sites including school parent center and public libraries in communities of need. Below is a complete overview of our programs. For further information on any of our programs, Contact Us! All SEE-LA Markets are certified to take WIC and Senior Farmers Market Nutrition Program (FMNP) checks from May until the end of November. 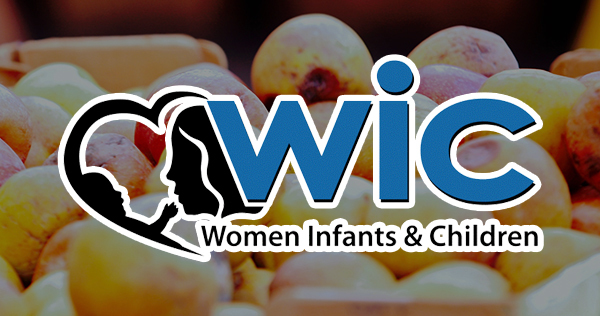 Five of SEE-LA’s markets also accept WIC Fruit and Vegetable checks (FVC) year-round. At some market sites, the WIC FVC vouchers are also able to be matched dollar for dollar at the markets. 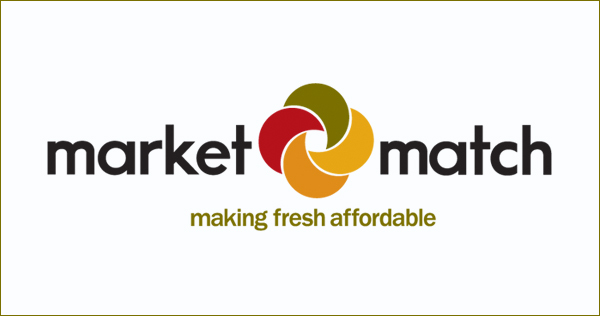 Check with your Market Manager to find out how to shop at the Market with your FMNP or FVC vouchers. SEE-LA is dedicated to improving access to fresh, healthy food for all Angelenos. In 2004, we led a countywide promotional effort for the use of the new Calfresh/EBT (the new name in California for food stamps) card at twenty-two farmers’ markets in LA County. 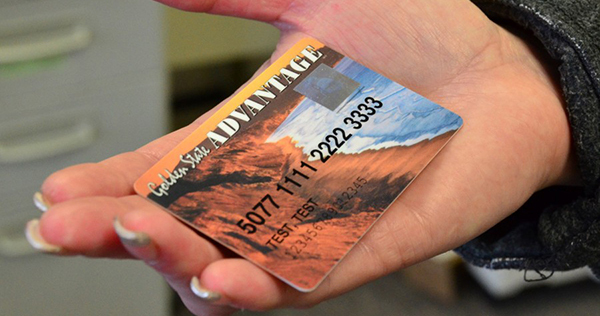 Calfresh customers can shop at the market with an EBT card- it’s quick and easy! Stop by the market’s information booth to find out more on how to shop with your benefits. For even more information on Calfresh benefits and how to apply, please contact the Los Angeles County Department of Social Services. In 2010, with funding and technical support from Roots of Change, SEE-LA implemented the “Market Match” Program, a healthy incentive program for low-income shoppers. When this incentive program first commenced, it provided shoppers spending federal nutrition benefits with $2 in Market Match funds for every $5 they spent per market day, up to $10 in matching funds. In May 2014, in partnership with the Ecology Center and Hunger Action Los Angeles (HALA), SEE-LA was able to expand Market Match through the sponsorship of First 5 Los Angeles to match benefits dollar for dollar. As a member of the California Market Match Consortium, SEE-LA benefited from a $3.7 million statewide award from the Food Insecurity Nutrition Incentives (FINI) grant in April 2015. This grant, along with other funding from partners like Kaiser Permanente and Seeds of Change, has allowed SEE-LA to expand the program’s reach. All SEE-LA Markets currently offer the Market Match program for Calfresh benefits. Visit your SEE-LA Farmers’ Market to learn more, or visit the Market Match website. The Bring the Farmer to Your School Program is a collaboration between Sustainable Economic Enterprises of Los Angeles (SEE-LA) and Los Angeles Unified School District (LAUSD) that allows local farmers to deliver interactive presentations while teaching students about local agriculture and the importance of eating more fresh fruits and vegetables. Students have a chance to ask questions, see pictures, and taste farm-fresh locally-grown produce. Farmers often bring varieties of fruits and vegetables that are unknown to students, like blood oranges, purple carrots, or cherimoya. In the spring of 2016, 10 local farmers served approximately 51,000 LAUSD students. This year, we are actively inviting parents to attend the farmers’ presentations. For more information on this program, visit our Bring The Farmer to School Page! SEE-LA’s program is part of a larger network of organizations providing comprehensive nutrition education and physical activity promotion across Los Angeles County. Our program operates under a unique model creating a food and education hub for the communities within SEE-LA’s MLK Campus Farmers’ Market and Central Avenue Farmers Market. We host free interactive nutrition education and cooking classes onsite during market hours. Nutrition education focuses on building basic skills that enable participants to confidently make healthy nutrition choices. Topics include MyPlate, label reading, expanding knowledge of the benefits of fruits and vegetables, and developing a deeper understanding of sugars, fats, and salt in our daily diets. We close each class with a recipe demonstration that illustrates the key points of the day’s lesson. Fresh local produce from our farmers is incorporated to create simple nutritious meals for all skill levels. Once complete, participants can re-create the day’s recipe at home by purchasing produce from the market. Participants that receive CalFresh benefits also have the opportunity to double their market spending with our Market Match incentive program. 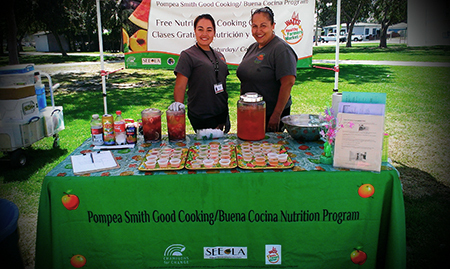 The Pompea Smith Good Cooking/ Buena Cocina Program served over 1,000 community members in its first year. In its second year the program served 3,900 community members, hosting 276 classes. Due to the first year’s success, the program was also able to expand its services to 31 additional sites which include community centers, school parent centers and public libraries in communities of need. For more information on classes, results and registration, visit our Good Cooking Page!